Most people who return to prison because they violated the terms of their parole or probation do so in the first few months after their release, raising questions about why 93 percent of people sentenced to probation in Clark County are under supervision for three to five years. The observation was one of many from staff at the Crime and Justice Institute, an organization that carefully reviewed detailed pre-sentence investigation reports from 800 defendants in Nevada to get a closer look at trends in the state’s justice system. 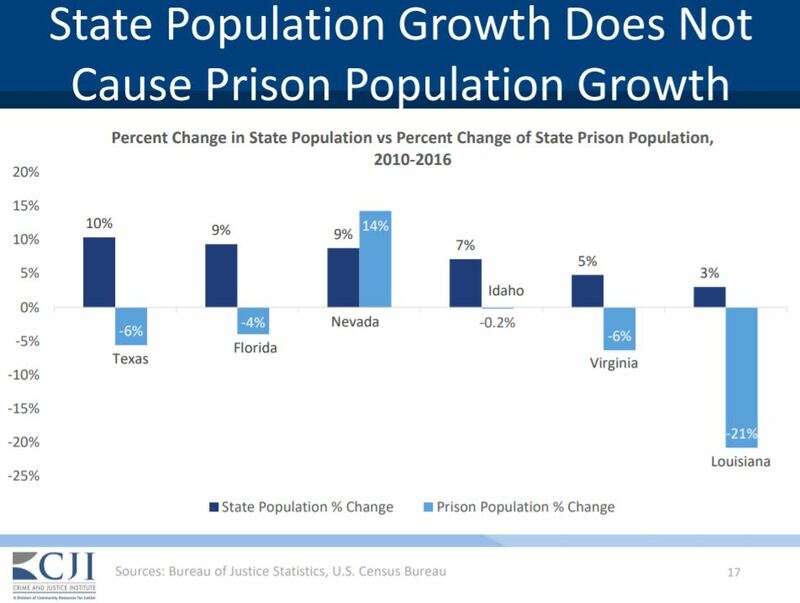 The group is doing a monthslong analysis of what’s driving the state’s rising prison population and is assisting Nevada’s Advisory Commission on the Administration of Justice as it considers ways to more efficiently use its resources. Researchers have already established that Nevada’s prison population is 7 percent higher than it was a decade ago even though prison rates nationwide are dropping, and even though violent crime is down 24 percent and property crime is down 25 percent in Nevada in the past decade. Nevada’s population has increased by 15 percent from 2007 to 2017, but analysts say growth doesn’t have to mean a commensurate growth in the number of inmates. They pointed to states including Texas, Florida, Virginia and Louisiana that have reduced their prison populations while the size of the state itself grew. State population growth compared with prison population change. Courtesy Crime and Justice Institute. Democratic Assemblyman Steve Yeager, chair of the Advisory Commission on the Administration of Justice that’s studying the issue, said that metric isn’t the point in the first place. Members of the committee haven’t been shy about challenging some of the conclusions from CJI, including hypotheses about what’s driving the prison population. One theory has been that the 42 million visitors who come to Nevada each year are driving crime and thus the prison population. But analysts rejected the theory that tourism leads to more crime, pointing to Florida as an example. Florida welcomed 112 million visitors in 2016, a 36 percent increase from 2010, and saw its prison population decline by 4 percent over that period. They also noted that at least three-quarters of defendants in Washoe County courts are Nevada residents (8 percent were from out-of-state, and residency could not be determined for 18 percent). The average length of sentence for inmates has increased 31 percent over the last decade in Nevada. And in spite of the longer stays, the rate of recidivism — the likelihood that someone will return to prison within three years of their release — is up across virtually all crime types. 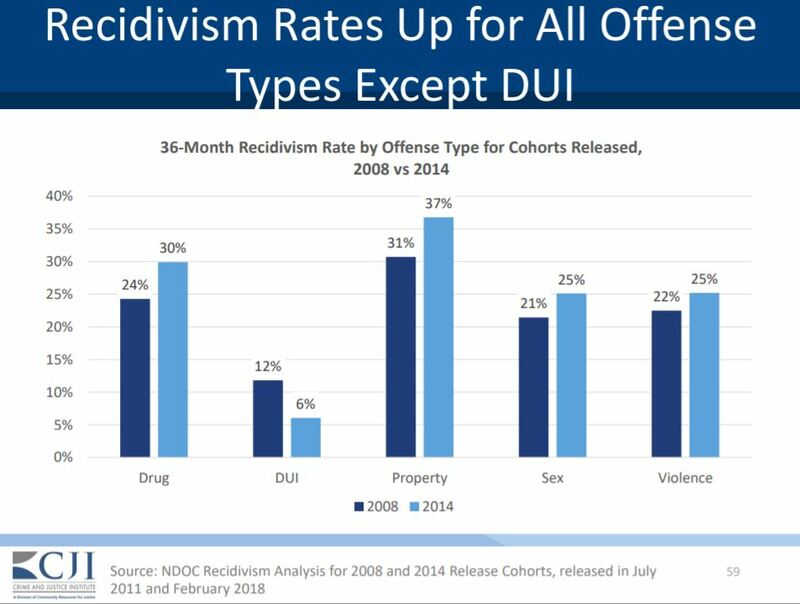 Nevada recidivism rates by offense type. Courtesy Crime and Justice Institute. 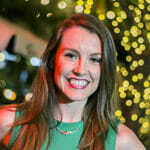 Researchers explained the trend in part by noting that incarceration can be bad for people, reducing their chances of success on the outside because they’re associating with people who are bad influences. Callaway pushed back, arguing that reducing recidivism is not the only goal of incarceration — that sentence length can be an expression of society’s disapproval of a person’s action and is meant in part to be punitive. The review also revealed other trends about who is ending up in prison. In 79 percent of the cases, there was evidence of a behavioral health issue — either substance abuse, a mental illness or both. The statistic was even higher for people convicted of being “habitual criminals” — a full 90 percent of them had behavioral health needs. Nevada’s broad definition of burglary has come under scrutiny during the process. While the typical understanding of burglary might be a home invasion, the file review indicated most people prosecuted under that statute aren’t invading a home: 63 percent of burglaries did not occur in a home, and there were no signs of forced entry in nearly 80 percent of the cases. In 73 percent of cases, there was no victim present. Drug cases were also singled out. People who are prosecuted for drug trafficking might not be shuttling drugs as part of sophisticated cartels and instead are nabbed for simply possessing the drug because of Nevada’s definition of trafficking — having more than 4 grams of a Schedule 1 controlled substance. Trafficking can lead to sentences of anywhere from 1 to 15 years depending on the quantity of drugs involved. Unlike in some other states, there need be no evidence that the person was intending to sell the drug for them to be prosecuted for trafficking. The file review showed that 46 percent of trafficking cases were classified as such for no other reason than that the defendant had at least the mandatory minimum weight of a drug with them; in the remainder of cases, there was other circumstantial evidence of a sale such as scales and ledgers or the sale itself was observed by an officer. Another trend is that 34 percent of cases in which a person on parole or probation returns to prison was a “technical violation” — someone breaking the conditions of their supervision as opposed to being convicted of a new crime or absconding. A full 70 percent of parole revocations were due to drug or property crimes, as opposed to a crime involving a person. And 44 percent of all “community supervision failures” were a result of drug issues. Analysts suggested a few evidence-based ways that Nevada might address the trends. One is reconsidering its one-size-fits-all approach for setting conditions of parole and probation, and instead setting conditions based on the findings of a risk assessment questionnaire. They also recommended that resources including housing and substance abuse treatment be front-loaded at the beginning of an individual’s parole or probation period, when they’re most likely to commit a parole violation. With parole violations less likely to come in the later years of supervision, continuing check-ins for years likely has diminishing returns. Natalie Wood, head of the Division of Parole & Probation, said her agency has taken numerous steps, especially after new funding came through last session, to implement practices that have been proven to reduce recidivism. That includes launching Day Reporting Centers, physical locations where parolees and probationers can meet with officers and take advantage of services and classes, and embedding parole officers in prisons to help inmates create release plans and streamline the process of sending them out into the community. She said the division is also better off after landing more money to help house released inmates. After hearing three detailed presentations about CJI’s data analysis, members of the advisory commission have been divided into two subgroups — one focused on sentencing and the other focused on release and re-entry. They’ll be focusing on developing recommendations ahead of a final meeting on Jan. 11, and some of those ideas could become criminal justice reform legislation up for debate in the 2019 session.